Hundreds of bikers have paid their respects to a road racing ‘flying doctor’ with a lap of his favourite track. Dr John Hinds crashed his motorcycle while providing medical cover at the Skerries 100 race meeting on Friday. The 35-year-old trauma specialist from Tandragee – who had campaigned vigorously for an air ambulance service in Northern Ireland – was rushed to hospital in Dublin but died on Saturday morning. Tonight (Tuesday), as his remains were transported north, Dr Hinds’ family invited the motorcycling fraternity to join his cortege for a final lap of the Tandragee 100 circuit. In a statement his partner Janet Acheson, parents and brothers said: “The widespread support and acknowledgement of John’s work, both nationally and internationally, has been incredibly heartwarming and a great source of comfort to us. “We are only now beginning to understand just how many lives John touched during his 35 action-packed years. 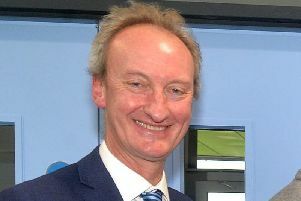 Dr Fred MacSorley – a fellow volunteer with the Motorcycle Union of Ireland for three decades before stepping down last year – said his passing will have left his colleagues at Craigavon Area Hospital “devastated”. Close friends and colleagues are said to be welcome at Janet and John’s home from 9am-noon tomorrow, and at the Hinds’ family home in Portaferry from 5pm-10pm tonight, and from 11.30am tomorrow. The statement adds: “Friends and family are welcome to join the cortege from Ballygarvigan Road, on the three-mile journey to St Patrick’s RC Church, Ballyphilip Road, Portaferry, for requiem mass at 2pm and burial in the adjoining graveyard”. The family has also vowed to continue the campaign for a helicopter medical service and have urged members of the public to sign the petition in John’s memory at change.org.